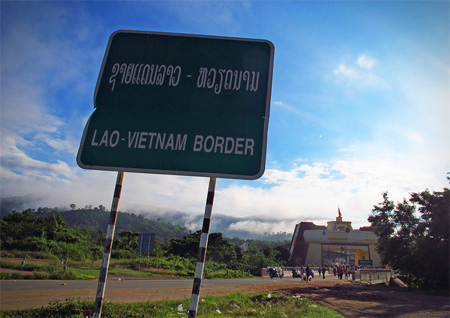 As Laos shares the longest border with Vietnam, there are several entry/exit points between the two countries. Laos-Vietnam bus service connects many cities/towns in the Laos and Vietnam crossing borders to/from several provinces.Lao provinces listed here have Laos-Vietnam. Click the links to see bus schedules and information related. The list is from north to south. There is one bus daily for Oudomxay – Dien Bien Phu City route. The buses used are normal 25-seat vehicles with no air-conditioning (and slow). The buses are operated by Lao and Vietnamese companies in rotation. The journey takes around 9 hours, crossing border at Tay Tran- Sobboun border check point. There are three buses running between Luang Prabang and Vietnam everyday except. One is to/from Hanoi, one is to/from Vinh and another is to/from Hue. Buses used for all destinations are spleeping, air-conditioned buses. All Luang Prabang – Vietnam buses operate out of Naluang Mini bus station and pass through Phonsavan and cross the border at Nam Khan/Namcan border checkpoint in Xiengkhuang province. Hanoi buses pass through Vinh, Dien Chau and Thanh Hoa (Vietnam) where they drop off/pick up passengers. The bus journey take 24-26 hours for Luang Prabang-Hanoi, 18-19 hours for Laung Prabang-Vinh and 28+ hours for Luang Prabang-Hue. In Hanoi the buses arrive to and/or depart from Nuoc Ngam station around 9km from the old quarter and 1km from Hanoi’s southern bus station along road NR1. In Vinh the buses arrive to and/or depart from Vinh bus station (known in Vietnamese as Bên xe Vinh), in the town centre. All Hanoi and Vinh buses pass through Namcan and Dien Chau where they drop off/pick up passengers. There is one bus daily running between Huaphanh in Laos and Thanh Hua in Vietnam. The buses are operated by a Vietnamese company. Buses used are 25-seat, non-air-conditioned. There is one bus daily to/from Vinh, except Saturday. Note: Luang Prabang – Vietnam buses pass through Xiengkhuang everyday except Thursdays. 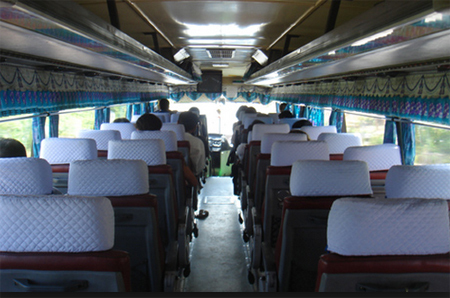 The buses used for Xiengkhuang-Vinh route are similar to those of Luang Prabang, 45-seat and 30-seat air-conditioned. The 30-seat bus runs on Monday, Thursday, Sunday and 45-seat run the other days. Lao buses are operated on Tuesdays and Fridays, Vietnamese buses are operated the rest of the week. All Xiengkhuang – Vinh buses are operated out of Xiengkhuang bus station, Ban Ngoy, Phonsavan town. They cross the border into Vietnam at the Nam Khan/Namcan border checkpoint and arrive at Vinh bus station around 10 hours later. 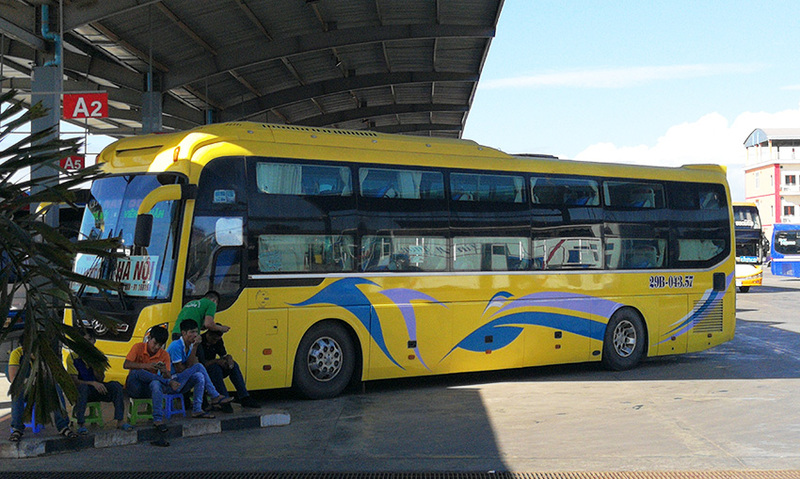 There are several buses to/from Vientiane capital that are operated by a number of companies. Some operate every day while others run a few times a week. Although many Vietnam destinations are listed on the board at the Southern bus station in Vientiane, there aren’t regular buses to some destinations such as Sai Ngon. They tend to operate only when there is enough demand. Buses to/from Vientiane Capital are overnight buses, departing in the evening and arriving at the destinations in the morning. Buses used are sleeping buses, which means they provide beds. There are a number of buses daily running between Khammuane (Tha Khaek town) and Vietnam. Khammuane - Hue and Khammuane - Dong Hoi ones are operated by a Lao bus company. Dong Hoi bus station is located at the intersection of Tran Hung Dao and Nguyen Huu Canh. There is a daily bus to/from Hue in Vietnam. There are also a number of buses for different days, to/from different towns in Vietnam (Hanoi, Vinh, Hue, Dong Ha and Danang), details as following. 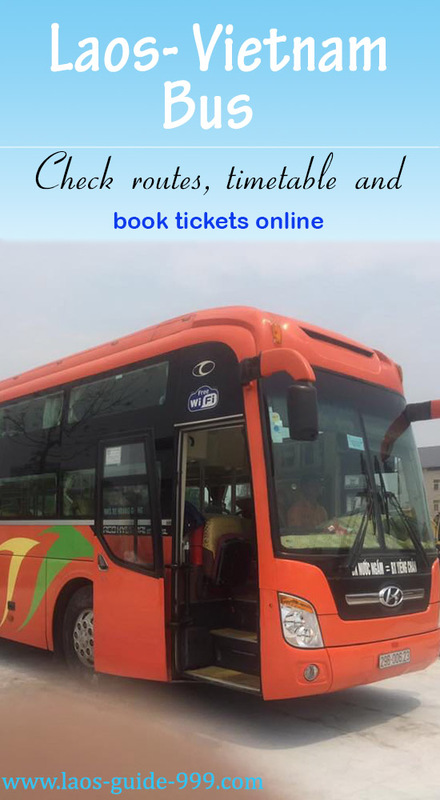 Tickets can be bought at the bus station. 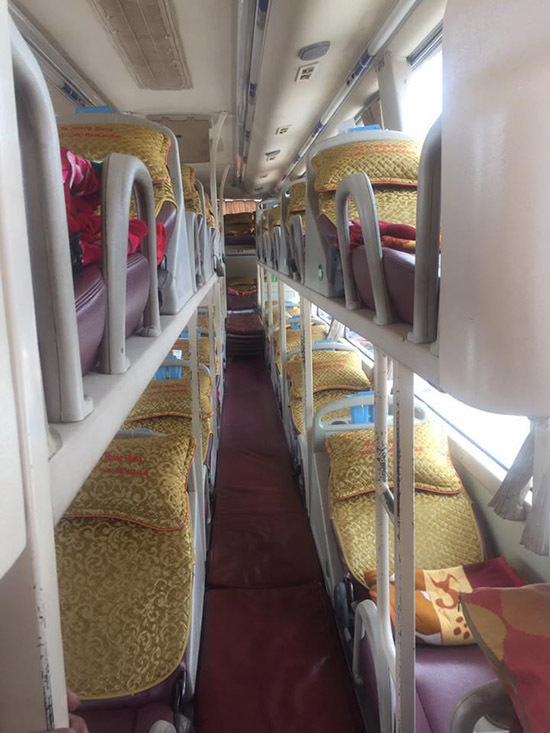 There are several daily buses to/from Pakse (main city of Champasak Province) from/to various cities/towns in Vietnam (Danang, Dong Ha, Hue, Yalai (or Gia Lai) and Quynhon). The Hanoi route has been discontinued due to low demand. Outbound buses to Danang, Dong Ha and Hue depart from KM7 Neua bus station while buses to Yalai and Quynhom depart from KM8 station in Pakse. Buses to/from Danang and Hue cross the border at Lao Bao/Dansavan crossing point. Lao visa on arrival is available at this check point. Vietnam doesn't provide visa at the border at all (Vietnam visa on arrival is only available at airports). 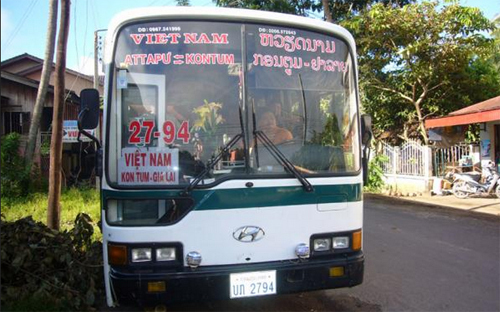 There is one bus daily to/from Yalai, Ngoc Hoi and Kon Tum. The bus departs from Attapeu around 07:00 and arrives in Yalai around noon or early afternoon. In Attapeu, bus tickets can be bought at Duc Loc restaurant near the market, prices are 60,000kip, 65,000kip and 75,000kip for Yalai, Ngoc Hoi and Kon Tum respectively. The inbound bus departs from Vietnam around 07:00 as well. For Lao and Vietnamese nationals, a visa is not required to enter one another’s countries, though a passport is required to travel further than the border town. Lao Visa: If you’re a national of one of the ASEAN countries, a visa is not required to enter Laos. Otherwise you can obtain a Lao visa on arrival at the immigration checkpoint at the border, see visa on arrival page for more details on the subject. Vietnam Visa: Please note that Vietnam visa on arrival is not available at border check points, it’s applicable to air travel only. You need to obtain your Vietnam visa beforehand if you plan to cross into Vietnam by bus. cities/towns, select date and click search button.